Opening Period: Although Pandanus Park is open to Veterans from ANZAC Day through to Remembrance Day each year access may not be available until late May or early June because of the condition of the roads after the tropical Wet Season and the depth of water over the Kalpowar Crossing of the Normanby River. Furthermore there is a now a lockable boom gate within the water of the Kalpowar Crossing. If this gate is locked do not attempt to drive around the gate posts as the water is deep enough to drown your vehicle and large boulders have been placed in the water extending well beyond the gate posts. The gate will be opened by COOK SHIRE only when the roads beyond Laura and into Pandanus Park are safe to drive. Driving past Road Closed signs is a Civil (Police) Offence. 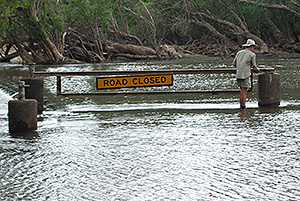 Note: The water on the Kalpowar crossing is home to Estuarine or Salt Water crocodiles. DO NOT walk through the water to the boom gate. 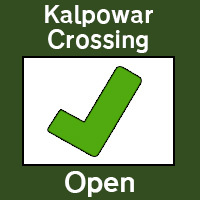 BE ADVISED ACCESS TO BOTH KALPOWAR CROSSING AND KALPOWAR STATION IS CURRENTLY OPEN. Early visitors have advised that if towing , take care as there is a large dropoff when exiting the causeway.